My Grading System is based on the overall pipe style. It's basically works as a categorization system. It's different from the conventional grading system used by most pipemakers, which is frequently based on the briar grain. In my little world, pipes are much more than what the briar has to offer. Here you gonna find what people refer as “typical pipes”. I thought that “drugstore” would be a good name for this grade. Drugtore pipes are also far from the really typical shapes, but in any case, they remind more traditional forms. 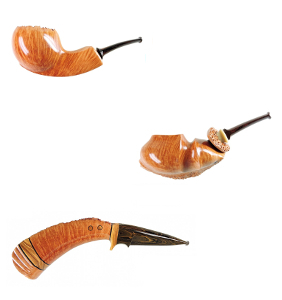 Even though a drugstore pipe can require lots of work, it cannot be framed as “Artistic” because it might remind a well known traditional shape. They must have artistic concept. Or let’s say: a more unconventional approach... Anyway... Pipes belonging to this grade cannot be any close to typical “drugstore pipes”. They do represent moments of creativity and dedication for the concept. These pipes are a step up in complexity from the Artistic grade often taking two week or more to complete. These pipes defy a standard grading system as they are so work-intensive that while grain is important it is overshadaowed by the sheer volume of detail and artistic effort spent on these pipes.